I LOVE my hat! I hope to visit your store soon! Thank you for your wonderful service! 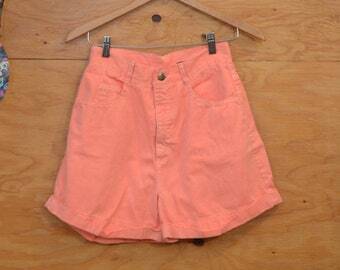 Tried and true vintage 80’s Pairs Blues shorts in peach denim, with high rise, available at Thatch Vintage. We are bringing some glamorous gowns to the Thatch Vintage collection. Stay posted for a beautiful curated selection, all styles all sizes. Welcome to THATCH. What is THATCH you ask? THATCH is to cover – your body, your space, your time. We scour our neighborhood, state, parish and globe for vintage treasures spanning the 50′s, 60′s, 70′s, & 80′s. THATCH offers a constantly changing stream of unique, top-quality, hand-picked vintage clothing and accessories shipped worldwide to an ever-growing list of satisfied repeat customers. With over two decades of collecting, and work in the fashion arts, we here at Thatch have honed our eyes to develop the skills we are using on your behalf daily – to catch only the finest quality, collectible vintage gems from the 1950′s to 1980′s and offer them to you here via the convenience of the Internet. Let our passion for vintage fashion add timeless style to your wardrobe. My travels have taken me across the USA, Western & Eastern Europe, Mexico, & Argentina. Many of my offerings here on Etsy include some of the best vintage treasures collected during my travels, as well as recent finds from the place I now call home. Welcome to THATCH. What is THATCH you ask? THATCH is to cover - your body, your space, your time. I scour my neighborhood, city, parish, state and globe for toys and treasures never tacky, always thatchy. 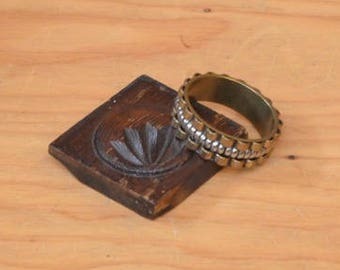 Great care is always taken to accurately describe and photograph the condition of all goods sold, but please remember that vintage items have been worn/used and enjoyed in their previous life and as a result may have slight imperfections. Items are gently cleaned before being offered for sale, but ultimately, it is the buyer's responsibility to clean/dry clean an item. Please ask any questions you may have about a certain item prior to purchasing, especially if you are unsure about the color, fabric, texture, flaws, size, or fit. I want you to be happy with your Thatching, so please help ensure this by reading all policies, and contacting me with any questions before you commit to a purchase. All sales are final. Please read measurements for wearables carefully to insure a proper fit. An item can NOT be returned because it does not fit. So please ask ANY and ALL questions before making your purchase. Payment is accepted via PayPal & Credit Card, and is required immediately in order to purchase. Shipment will be made within two days after funds have cleared. Unless otherwise stated in a listing, all goods are shipped via US Postal Service at the rate indicated in the listing for domestic orders. International buyers MUST inquire prior to purchasing item(s) to compute shipping rate in advance. For all goods delivered outside the USA, please be aware that once goods reach your country's customs, all import duty fees are the buyer's responsibility. If you wish to request an alternate shipping method for either USA or International delivery, please make that request prior to purchasing any item(s). Quoted shipping charges include a handling fee for all items to help defray the cost of packaging materials, delivery confirmation charges, etc. Insurance is always optional. LENGTH: The back of the neck to bottom of hem. BUST: Armpit to Armpit x 2. WAIST: Side seam to Side seam at the waist or an estimate x 2. HIP: Side seam to side seam at the hip (usually fullest part of the garment x 2). SLEEVE: Shoulder seam to bottom of sleeve. SHOULDER: from shoulder seam to shoulder seam. Please measure yourself carefully, or compare the item to the measurements of something you already own that has a similar cut and fabric and fits you well. The words used to describe the condition of a garment could be open to interpretation, so I think it might be helpful to clarify the terms used. NWT~ New with tags, never washed or worn; no flaws. NWOT~ New without tags, never washed or worn; no flaws. MINT~ Appears new, no signs of wear; washed and possibly worn; no flaws. EXCELLENT~ Previously worn, with only very slight wash wear; no flaws. VERY GOOD~ Previously worn with moderate wash wear/fade, but no visible flaws. GOOD/PLAY~ Previously worn with minor visible flaw(s), and/or significant wash wear/fade. FAIR~ Previously worn with significant visible flaw(s), and/or heavy wash wear/fade. POOR~ Not wearable, has severe flaws/damage, but with desireable useable element(s). Flaws might include spots, stains, holes, tears, fabric irregularities, or problems with buttons, zippers, snaps, etc... Please see listing descriptions for specific condition details. Every package shipped will come to you gift-wrapped with an extra goodie to show appreciation. The goal in packaging an item, is to ensure that you receive your order in the same condition it was in when it left THATCH studio. Important note: THATCH carries inventory for sale on both Etsy and eBay. When an item is sold in either marketplace, it will be removed from our listings in the other as soon as possible. In the rare event that one item is selected for purchase by both an eBay buyer, and an Etsy buyer before we are able to remove the sold item, it will be considered purchased by the first buyer of record according to eBay and Etsy's time-stamps. We apologize in advance if an item you attempt to purchase has already been sold, and will refund any payment made right away, as well as offer you free domestic shipping on your next purchase of any alternate item if this occurs. Accessories and other items shown in photos are not for sale unless otherwise noted, and can sometimes be found in other listings.